Nice start :) I love what you have already put up in your bedroom. Good luck with the rest of your move. Stress manifests itself different ways for different people. Your's is less violent than throwing plates at the wall so you should be patting yourself on the back I say! Maybe because the more insane and stressful it all is, the more we need to be soothed, and nothing does that like a great big project. I look at it this way: if we were a different kind of person, we might be disposing of our spouses/significant others every so often, but with us, it's just fibers and fabric and charts. Great start--made me hungry to pick up my needle. I'll be interested to see if you get bored working on the black. I did pretty well on a red project, but it's stalled now. 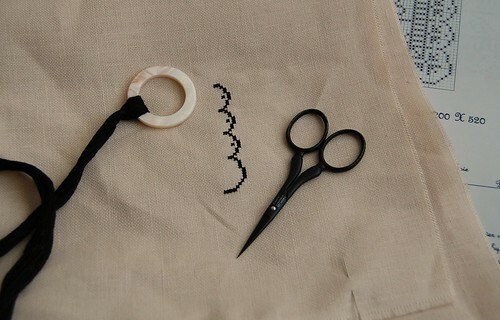 I think most stitchers do the same thing, start projects when stressed. I know that I do. Love your new stash--you encouraged me to visit Froggy Stitcher and of course, I had to place an order, also. Will share when it arrives. I hope you stick with this one I want to see more, and more, and more lol. Good Morning Nicole! I've enjoyed reading thru your posts & looking at all your stitching : ) WOOT! You have some awesome projects finished == and in the works!! Hope you're feeling less stressed out soon!